From April 1, 2017, the pass has became unavailable to Japanese nationals with permanent residence outside of Japan. However, from June 2017, it again became available to Japanese nationals who can prove that they have been living abroad for at least the past ten years. Check out the beta version of our new Japan Rail Pass Calculator. The Japan Rail Pass (also commonly called JR Pass) is a very cost effective rail pass for long distance train travel in Japan. It can be used by foreign tourists only, and offers unlimited use of JR trains for one, two or three weeks at a cost that residents of Japan can only dream of. The pass comes in two types: ordinary and green car. The latter is valid on green cars (first class cars) that offer more spacious seats than ordinary cars. 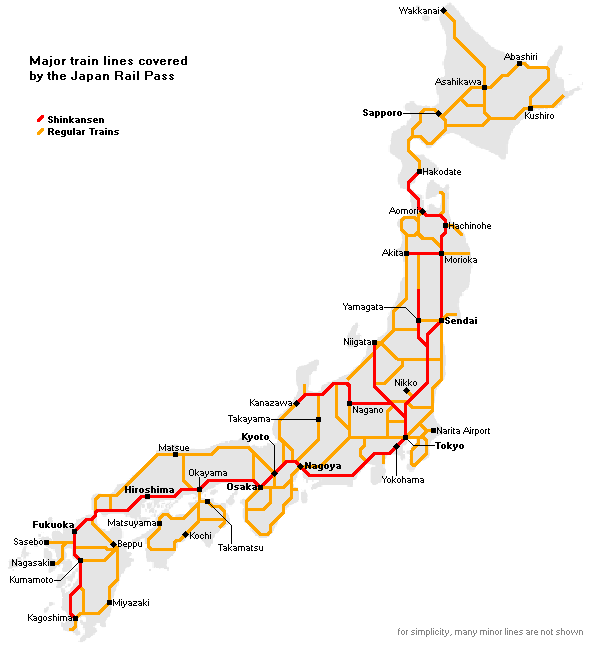 The pass is valid on almost all trains operated on the nationwide network of JR (Japan Railways), including shinkansen, limited express, express, rapid and local trains. Below is a map showing the major train lines that can be used with the pass. Aoimori Railway between Aomori, Noheji and Hachinohe to access the JR Ominato Line to the Shimokita Peninsula. IR Ishikawa Railway between Kanazawa and Tsubata to access the JR Nanao Line to the Noto Peninsula. Ainokaze Toyama Railway between Toyama and Takaoka to access the JR Himi Line and JR Johana Line. The Nozomi, the fastest category along the Tokaido/Sanyo Shinkansen is not covered by the Japan Rail Pass. However, pass holders can use Hikari trains along the same line, which stop at a few more stops than Nozomi trains and are slightly slower and less frequent than Nozomi trains. Pass holders using a Nozomi will have to pay the full fare. The Mizuho, the fastest category along the Sanyo/Kyushu Shinkansen is not covered by the Japan Rail Pass. However, there are only six round trips per day, anyway, and pass holders can use Sakura trains along the same line, which are more frequent and only sightly slower. Pass holders using a Mizuho will have to pay the full fare. There are about a dozen JR trains which partially make use of tracks owned by different railway companies. Japan Rail Pass holders will have to pay the fare for these non-JR sections. Please see ourspecial page on JR trains using non-JR tracks for a list of these trains. 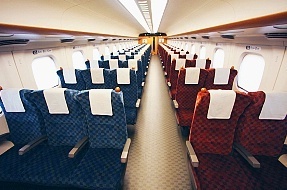 Special compartments, such as berths on night trains, are not fully covered by the Japan Rail Pass. A supplement fee has to be paid. See our night train page for more details. 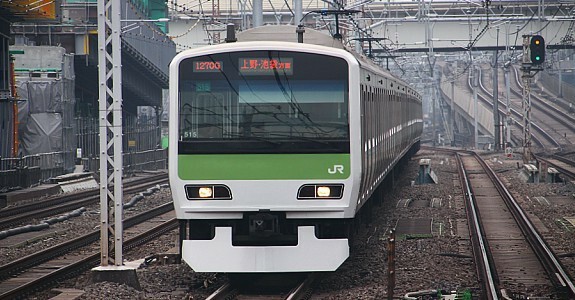 There is a small number of suburban “liner” trains on the JR network, e.g. 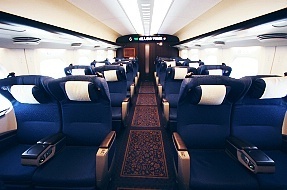 Home Liner, which require a special “liner ticket” and are not covered by the Japan Rail Pass. However, since these trains are targeted at suburban commuters, foreign tourists are unlikely to use them. Confusingly, there are also a few trains that contain “Liner” in their names, but do not require a liner ticket, such as the Marine Liner, Seaside Liner and Ishikari Liner. These trains are fully covered by the Japan Rail Pass. The pass is not valid on any highway buses. It used to be valid on a small number of JR highway buses before spring 2013. Japan Rail Pass holders can make seat reservations for JR trains for free (more details below). The Japan Rail Pass offers discounts on regular rates at JR affiliated hotels, such as the Metropolitan, Mets, Associa and Granvia hotel chains, which are usually conveniently found near or inside railway stations. Note however, that discount rates available elsewhere, e.g. through online hotel reservation websites, are often just as good or better. Upgrading to Nozomi or Mizuho possible? No, it is not possible. When riding the Nozomi or Mizuho, Japan Rail Pass holders will have to pay the entire ticket price. Be careful not to board a Nozomi or Mizuho train by mistake. Green cars offer larger seats, more foot space and enhanced board service, and they tend to be less crowded than ordinary cars. They are available on most shinkansen and limited express trains and on a small number of local trains. Many travelers find the size and foot room of ordinary seats sufficient, but those who wish to have additional luxury, should go for the green car. Upgrading to Green Car possible? It is possible, but the ordinary rail pass will cover only the base fare. The green car fee and eventual shinkansen or limited express supplement fees will have to be paid separately, which usually adds up to a rather large amount. Can the pass be shared or transfered? No, the Japan Rail Pass is a strictly personal pass and can only be used by the person whose name is printed in the pass. Pass holders may be asked by railway staff to produce their passports in order to confirm ownership of the pass. Validity: Calendar Days or 24-Hour Periods? The validity period of the Japan Rail Pass is based on calendar days (midnight to midnight) rather than 24 hour periods. For example: when starting to use a 7-day pass at noon on day 1, it will expire at midnight at the end of day 7 rather than at noon of day 8. What happens if I am on a train when the pass expires at midnight? If you happen to be on board of a train at midnight, the Japan Rail Pass remains valid until the end of your journey, i.e. until you leave your final station through the ticket gates. This is true even if you transfer trains after midnight. However, if you transfer to a shinkansen, limited express or express train after midnight, the pass will not cover the express supplement for that train anymore. The Japan Rail Pass can be used only by foreign tourists to Japan. The pass can be purchased via the internet or a travel agent outside of Japan. You will then receive a voucher that has to be exchanged to the actual pass inside Japan and within three months of purchase. From March 8, 2017 to March 31, 2018, it is also possible on a trial basis to purchase the Japan Rail Pass at an increased cost (see table below) at selected stations inside Japan. The stations include Narita Airport, Haneda Airport, Kansai Airport, Shin-Chitose Airport, Tokyo, Shinjuku, Nagoya, Osaka, Sapporo, Sendai, Niigata, Yokohama, Hiroshima, Takamatsu and Hakata. The Japan Rail Pass can be used only by short term visitors to Japan, who enter Japan as “temporary visitors”. It can also be used by Japanese nationals who can prove that they have been permanently residing abroad for at least the past ten years. 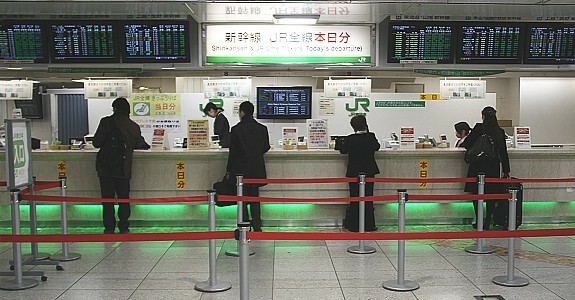 The Japan Rail Pass can be purchased online or through travel agents across the world. A list of some travel agencies is found on this page. On a trial basis, the pass is also sold at selected stations inside Japan from March 8, 2017 to March 31, 2018 at an increased cost. Where and how can the voucher be exchanged? The voucher can be exchanged at designated major JR stations across Japan, including the JR stations at Narita Airport and Kansai Airport. See this page for a list of designated stations and opening hours. Hand your voucher and passport (photocopy not accepted) to the ticket counter staff. After some processing, you will receive your Japan Rail Pass. When you exchange your voucher to the actual pass, you do not need to start using the pass from the same date. You can select any date within a one month period as your starting date. However, once the actual pass is issued, the starting date cannot be changed. See our separate pages about the basics on how to use trains and shinkansen in Japan. Generally, the Japan Rail Pass is your ticket. No other ticket is needed except when using a reserved seat, in which case you will get a seat reservation ticket. Seat reservations are free with the Japan Rail Pass. 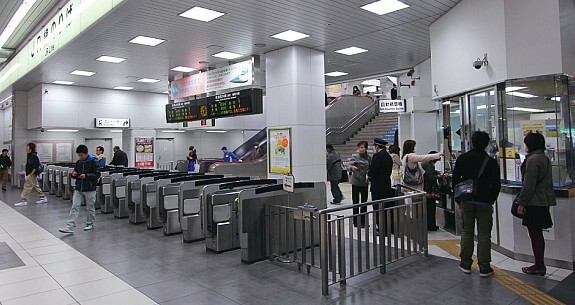 When passing through ticket gates, Japan Rail Pass holders cannot use the automatic ticket gates, but have to pass through the manned gate and present their rail pass to the staff. On rare occasions pass holders can be asked to also show their passports. Japan Rail Pass holders can make seat reservations for free by presenting their actual rail pass (as opposed to a voucher) at any JR ticket office across Japan. Reservations cannot be made on board of trains or at ticket machines. 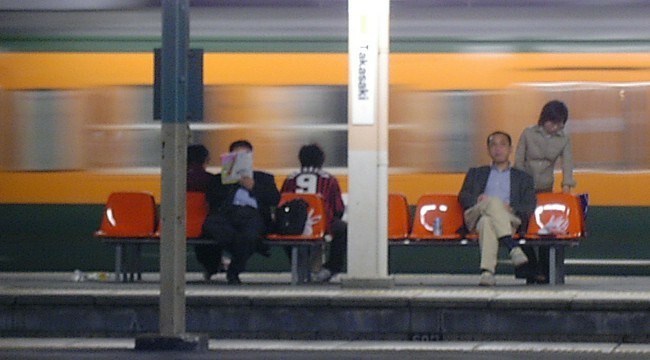 Some trains in Eastern Japan can be reserved over the internet. See the pages on how to use trains and shinkansen for more details about how to make a seat reservation. Many trains do not get booked out, but some do. During busy travel periods, some trains may get booked out several days in advance. For peace of mind it is always recommended to make seat reservations especially when traveling in groups and you wish to sit together. After all, seat reservations are free for rail pass holders. On a few trains reservations are mandatory (see above). What happens if I miss a train for which I have seat reservations? This may cause inconvenience to other passengers and the railway company and should be avoided by all means. If it does happen, try to cancel your reservation at a ticket office before it is too late. You can then ride a later train in the non-reserved section or make a new reservation for an upcoming departure. Does the Japan Rail Pass pay off? It depends on your itinerary! It won’t pay off for urban travel alone. But if you cover some long distances within a relatively short time period, the pass is likely to pay off. Furthermore, the pass provides convenience and flexibility in addition to saving money. For example, pass holders won’t need to buy tickets whenever they ride trains and can spontaneously make side trips at no additional cost. On the other hand, the pass is not valid on Nozomi trains which can be a small inconvenience when traveling along the Tokaido/Sanyo Shinkansen. Note also that some travel agents might charge a service fee or apply an unfavorable exchange rate, resulting in an inflated cost of the rail pass. When does it pay off? As a rule of thumb, the 7-day pass costs about the same as regular shinkansen tickets for a round trip between Tokyo and Kyoto. It will not pay off if you travel less than that. Our Japan Rail Pass Calculatorand the timetable website Hyperdia are good tool to compare regular ticket costs with the pass. 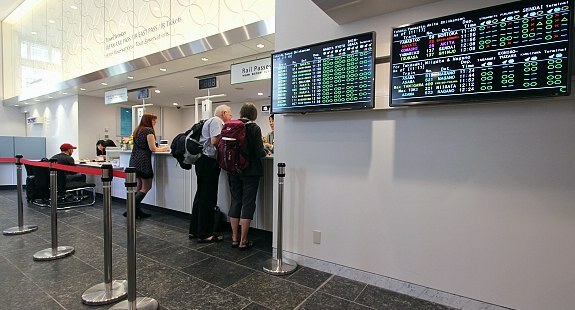 The access pages of destinations in our sightseeing guide also contain lots of fare information. Is it useful for urban transportation? Urban transportation alone will not justify the purchase of a Japan Rail Pass. A pass will only pay off if some long distance travel is involved. However, in cities that are well served by JR train lines, the Japan Rail Pass can also be useful for urban transportation. Tokyo and Osaka are two of the few cities where the pass is quite useful, particularly thanks to Tokyo’s Yamanote Line and Osaka’s Loop Line. In many other cities, however, for example in Kyoto, non-JR trains, subways and buses are more convenient but not covered by the Japan Rail Pass.